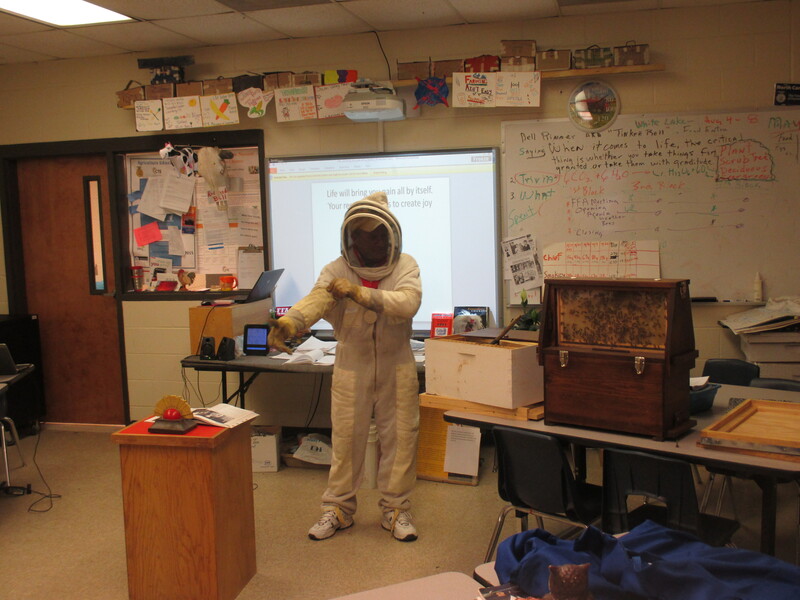 Jeff Stone, Master Bee Keeper from Wagram, NC presented a program on the importance of honey bees to our food supply in agriculture on May 23, 2014. Mr. Stone presented the program to the Agriculture Production ll, Horticulture l and Horticulture ll classes. Mr. Stone is the owner of 200 bee hives and the only Master Beekeeper in Scotland County. He is a member of the North Carolina Master Bee Keepers Program which is the largest in the United States. He received this certification after achieving the levels of Certified, Journeyman, Master and the final level of Master Craftsman. Written, practical and oral test with a minimum of two years as a beekeeper were the standards for the certification. The topics discussed were beekeeping as an occupation, the life cycle and jobs of the queen, drone and worker bee, importance of honey bees to agriculture food production, pollination and plant production, safety around honey bees and the true facts about the behavior of the honey bee. Mrs. Faurot’s AP Biology and Mrs. Pilarczyk’s Health Science II students also attended. Biology ties in with the life cycles of the queen bee, the life cycle of the drone, and the life cycle of the worker bee. The Agricultural Education curriculum covers leadership skills and opportunities related to the horticulture industry, careers related to horticulture, summarizes plant anatomy, factors relating to plant growth and development, explores pesticide safety practices, and understands approved production and management practices for optimum return to land, labor, capital and management for each of the major agricultural crops produced in North Carolina.